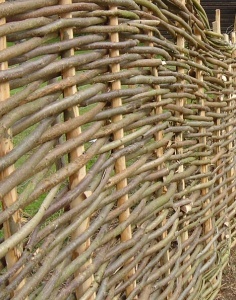 Please note that we make all our continuous weave Hazel Fencing in-situ. It cannot be bought “off the shelf” as it needs to be woven on-site. Alternatively, Hazel Hurdles on the other hand are individual panels that are made in advance and can be delivered already assembled. We can install hurdles for you, or you can install them yourselves. We can also supply the posts to attach the hurdles to if necessary. Chestnut stakes are banged into the ground and single rods of hazel are woven between the uprights. This means that we need a clear fence line over soil or turf (so that the posts can be banged in to a depth of roughly 2′) and clear of obstructions. We also need space either side of the fence to allow us to install the weavers. 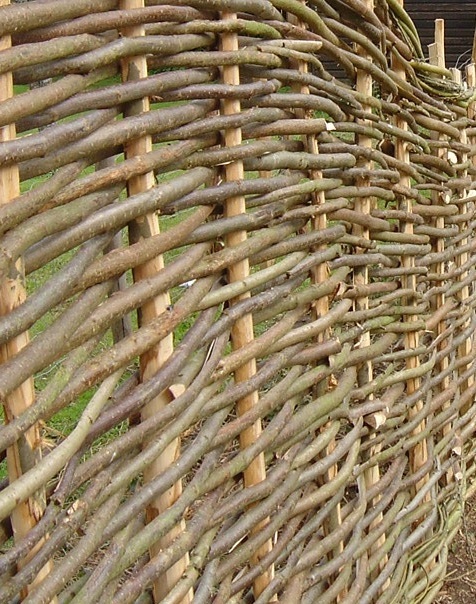 We make our fencing with whole-rod hazel, or split-rod (cleft) hazel. The continuous weave hazel fencing uses a heavier grade material than hazel hurdles, allowing for greater strength and durability. In ideal circumstances, where there are no footballs being kicked against it/bins pushed into it/cars reversed into it, a continuous weave hazel fence can last between 8-10 years. Additionally there is no need to treat the fence as it is naturally durable. The nature of the installation means that the fence can be fitted to your garden – it can curve up, or down, and doesn’t need to be in a straight line. We can make the fence to any height up to 8′. We are members of the Sussex and Surrey Coppice Group,. We harvest our hazel from woodlands around Kent, Sussex and Surrey and we only ever use British Hazel. As it is best to make the fencing while the hazel is still fresh, this type of fencing is generally installed after leaf fall (ie November) and before the materials have dried out too much (July). However, please do not wait until the Autumn to contact us as our order books tend to fill up during the Summer! For a standard height fence with no complications, prices start at £3.50 per square foot. Please note that the upright stakes are split stakes. This means that one side is curved and shows the brown bark, while the other side is flat and shows the whiter wood. Please also note that it IS possible to see through the fencing. Due to the nature of the materials used, there are natural kinks and bends. See photo.